Join us and help shake up the way work gets done. At Field Nation, we make work play, and we play together to win. We tackle complex challenges, work hard, high-five, and celebrate often. We’re risk takers, fast learners, and experts in our fields. 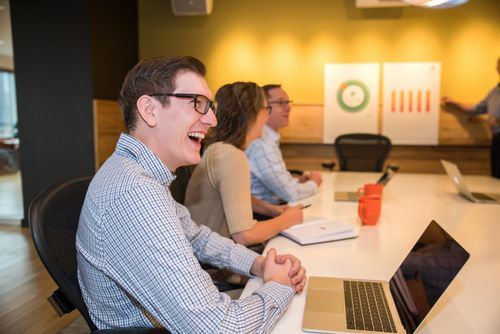 Collaboration and creativity are at our core, allowing us to build a better way for businesses to get work done, and a company that we’re proud of working for each and every day. Our core values shape our culture and how we approach our work each day. They define how we work and are what makes us, us. Located in downtown Minneapolis, our headquarters are easily accessible via public transportation and skyway. Our employees take advantage of our central location to easily access a multitude of nearby restaurants, events, and entertainment all year long. Our employees regularly participate in local community meetups and volunteer opportunities, supporting organizations such as Girls Who Code, MicroMN, Women Who Code, and Twin Cities Startup Week, just to name a few! From nacho bars to build-your-own waffle station, we love to recognize birthdays, anniversaries, and major milestones. We’ve even been known to celebrate impromptu life moments and we make a point to get together every other week to celebrate the small wins along the way. Our unlimited time off benefit just gets better! Employees at Field Nation are encouraged to take time off and recharge. Yes, we pay each U.S. employee a yearly vacation bonus to take time off and relax or explore somewhere new! We offer all of the usual suspects of medical, dental, vision, and disability; life insurance, plus a few extras! Our employees also enjoy paid parental leave, a competitive 401K match, commuter perks, and discounted gym access. As we grow, we want you to grow with us. Individual development plans, support for professional memberships, and access to conferences help our employees develop deeper skillsets and, in return, flourish and keep Field Nation moving forward. Take a look at our current open positions. See something that’s a fantastic fit? Get that application submitted – we can’t wait to meet you! Don’t see your dream job yet? Follow Field Nation on LinkedIn to keep in touch. We respect and encourage diversity in background and thought. What makes us succeed is the sum of all of our unique parts coming together to work towards a shared vision. Join us – we’d love to work with you! Learn about our roots and where we’re headed.